Forrester has positioned VMware as a Leader in The Forrester Wave™: Hyperconverged Infrastructure, Q3 2018, and VMware received the highest score in the strategy category. 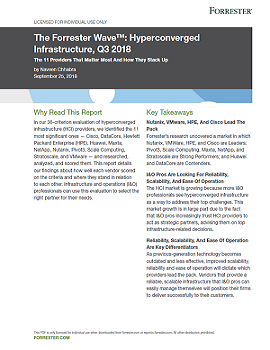 We believe this report validates VMware's ability to not only envision what's next, but to rapidly deliver benefits that solve customer's most challenging problems in three key areas: supporting business-critical applications, enabling hybrid cloud, and simplifying operations to enable quick onboarding. As HCI continues to be adopted across organizations of all sizes, VMware continues to provide customers increased agility while streamlining operations from edge to core to cloud. VMware HCI's broad flexibility enables customers to deploy vSAN on any device in any cloud.